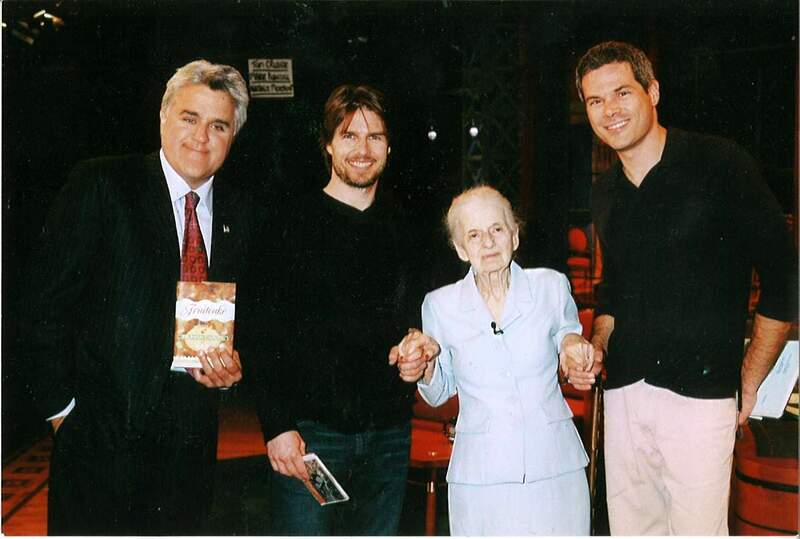 Jay Leno, Tom Cruise, Marie Rudisill, and Steve Ridgeway --- after taping The Tonight Show. 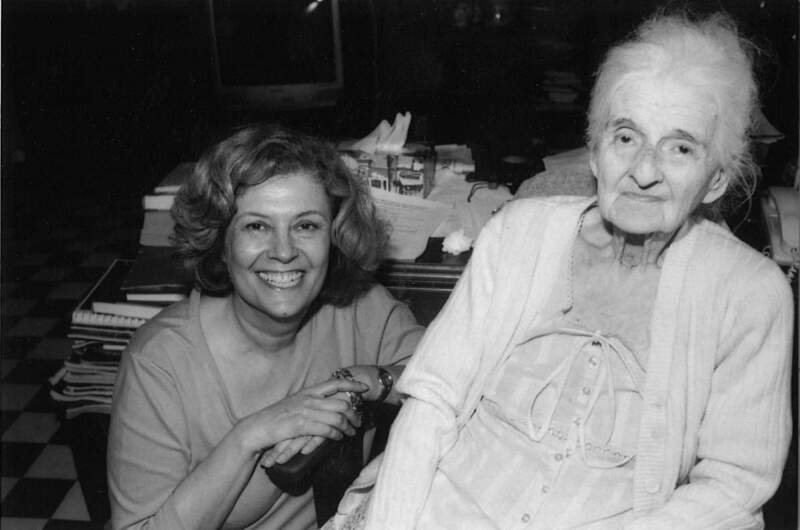 Marie Rudisill would have turned 100 years old this spring. Marie is best remembered as “The Fruitcake Lady” on The Tonight Show with Jay Leno, a gig that began in 2000 and lasted until her death six years later. Known for her quick wit and sharp tongue, Marie won the adoration of the audience. Her status as a pop culture phenomenon began when she instructed Jay and guest Mel Gibson on making a fruitcake. What a mess the guys made, and how she scolded them, as only a little old lady can. Tom Cruise was next up, followed by Cuba Gooding, Jr., and Hugh Grant. The shtick was always the same. And it was always very funny. Marie had the perspective of times past. She was Southern to the core, only two generations removed from the Civil War, yet she lived in New York City during the Great Depression. She married a Japanese artist, a union her family had annulled. She later settled in the Carolinas with her second husband and raised a son. Instead of being a stay-at-home mom when all moms stayed at home, she undertook numerous careers including wheeling and dealing antiques and cooking up a storm. Rather than slowing down, she was writing books and cookbooks. She was close to her nephew Truman Capote, yet their falling out over some paperweights hurt her deeply and lasted over a decade. She eventually retired to Florida near family, yet yearned to return to Monroeville, Alabama, her hometown. 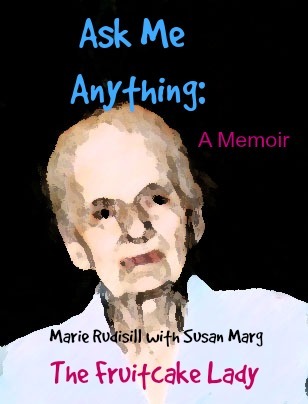 Marie and I developed a special relationship when I was working on her memoirs the last year of her life. “You can write whatever I tell you,” she assured me on more than one occasion. “It’s all fair game.” We talked on the telephone about three times a week. When I was delving into a new topic, our conversations might last forty to fifty minutes. Other times, it was just a “hello, how you doing” kind of call. One exchange we had on several occasions went as follows. “How’s my sweetie pie, Jim?” she inquired of my husband. “No, he’s my sweetie pie,” I responded, wanting to make sure we understood each other. “If I were twenty years younger, I’d go after him,” she informed me. “Well, good luck with that,” I retorted. And then we laughed. Regardless of the subject matter or the mood we were in, we never got off the phone without a chuckle. Is that all you have to say for yourself?” Marie asked as we wrapped up a conversation. The author visiting Marie Rudisill at home in Florida. “Yes, I can’t think of anything else,” I replied.